Interval training, alternating bursts of speed with longer recovery intervals, is now considered a beneficial exercise for more than just athletes. Interval training can consist of bursts of speed for a set amount of time or for a distance. These intervals are then followed by a longer period of rest with either walking or jogging, depending on your fitness level. This type of training helps to improve aerobic capacity, which benefits heart health as well as weight loss. Since intervals are all about changing the pace at which you run, your heart rate will be constantly rising and falling during the workout. This means that your body will be burning more calories due to the rise in your heart rate. With intervals, you can burn more calories than you would at a steady pace run but in the same amount of time or less. Anytime you increase the intensity of a physical activity, you also increase the number of calories that you are burning. Even though interval training consists of only short bursts of speed, this is enough to raise your heart rate and increase your calorie burn. Since your heart rate is increasing throughout the workout, your body will also continue to burn calories at a higher rate after your workout, which can help lead to weight loss. The bursts of speed you perform during interval training help to get you into better cardiovascular shape. When your aerobic capacity improves, you will be able to work out for a longer period of time without getting tired. It also means that you will be able to complete a workout quicker. For example, if you are working toward a shorter mile time, training with intervals can help you to run one in a shorter amount of time due to your improved fitness level. 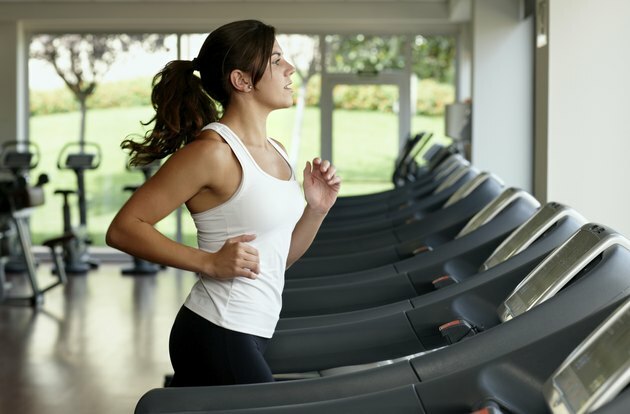 If running is your typical cardio workout of choice, hitting the treadmill a few times a week can get boring after a while. Adding intervals into your normal workout is a way to fight off boredom and keep you motivated and focused. The change of pace during intervals also helps to make the time go faster, making your workout seem less like work. How Many Calories Are Burned on a 2.5 Mile Run? How Much Should You Run to Be in Shape?